Can you confirm these amateur observations of Anolis fortunensis? Distribution W Panama (Fortuna Forest Reserve, on the Central Cordillera); Type locality: Reserva Forestal de Fortuna, along the Rio Chiriquí, in front of the Estacion Hidrometereológica de Instituto de Recursos Hidráulicos y Electrificación (IRHE) in Bijau, 1050-1075 m elevation, Chiriquí Province, Panama. exsul: Panama (Chiriquí); Type locality: Reserva Forestal de Fortuna, along the Rio Chiriquí, some 100 m from the mouth of Quebrada Bijau (8° 45’ 11’’ N, 82° 11’ 07’’ W), 1050-1075 m elevation, Chiriquí Province, Panama. 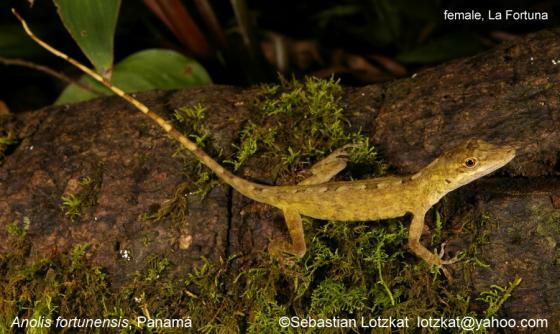 Comment Anolis fortunensis has a light brown dorsum, a large dewlap reddish orange with yellow scales and the free margin red, short hindlegs, smooth ventral scales, and a pair of enlarged postanal scales. PONCE & KÖHLER (2008) synonymized A. exsul with A. fortunensis.